Since 2004, after open total gastrectomy(OTG), we have included a pouch formation in Roux en Y reconstruction protocol (PRY), in order to increase the amount of meal to be taken once. 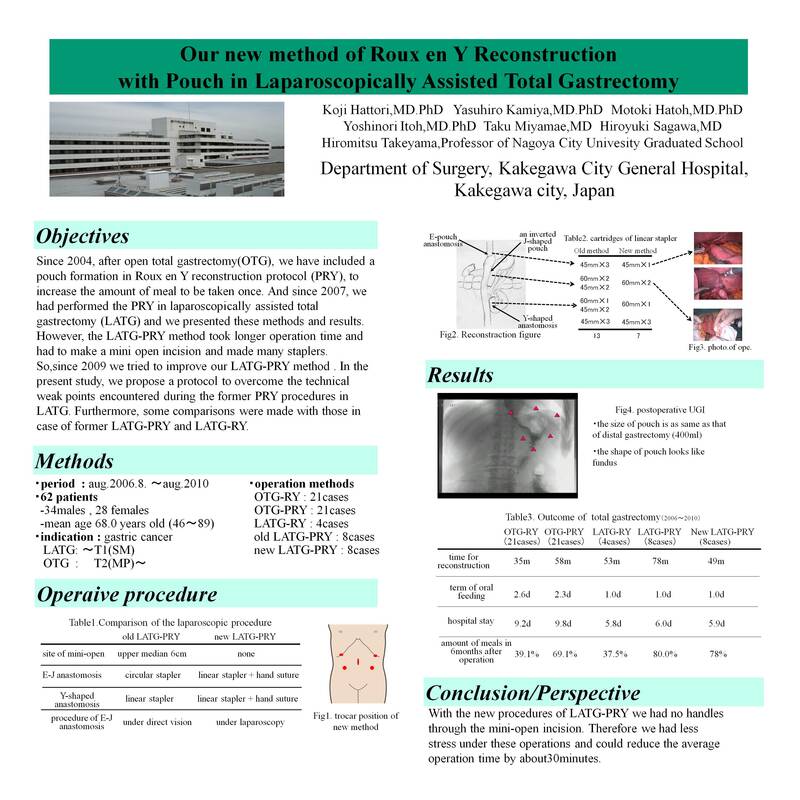 And since 2007, we had performed the PRY in laparoscopically assisted total gastrectomy(LATG) in 8 cases and we presented these reconstruction method and these results. However, at this point, the LATG-PRY method took longer operation time and had to make a mini open incision of 6cm long and made many staplers. So, in order to resolve these problems, since 2009 we tried to improve our LATG-PRY method in 8 cases and reduced reconstruction time by the new method without a mini open incision. In the present study, we propose a protocol to overcome the technical weak points encountered during the former PRY procedures in LATG. Furthermore, some comparisons were made with those in case of former LATG-PRY and LATG-RY. The former procedures of PRY : Skin incision of 6 cm-length was made at the midline of epigastric region. Jejunum was pull out through incision, formed an inverted J-shaped pouch of 15 cm-long or a Y-shaped anastomosis , and then it was placed back into the abdominal cavity each other. The pouch was anastomosed with a circular stapler to the esophagus under direct vision through the 6cm midline incision . The new procedures of PRY : All reconstructive procedures were performed laparoscopically without a mini-open incision. The jejunum at 30cm from Treitz lig.was cut. An inverted J-shaped pouch of 15 cm-long was formed and was anastomosed to the esophagus with a linear stapler and its entry hole was closed. Then laparoscopically the Y-shaped anastomosis was formed with a linear stapler and its entry hole was closed. Operation time : Average operation time of the former procedures(8cases) was 78 minutes and one of the new procedures(8cases) was 45 minutes. Hospital stay: The average length of hospital stay after surgeries was 6.0 days in the former procedures and 6.1 days in the new procedures. Amount of meals: The average amount of meals the patients could take per once in six months after the surgeries were 78.0% in the former procedures and 75.0% in the new procedures. So between the former procedures and the new ones, there were no differences in amount. The amount of meals the patient of both pouch methods could take were twice as much the patient of LATG-RY method(37.5%) could take. In methods presented here, no severe complications such as anastomotic stenosis or leakage were encountered, indicating that these methods are safe and practical. With the new procedures of LATG-PRY we had no handles through the mini-open incision. Therefore we had less stress under these operations and could reduce the average operation time by 30minutes.